How to Convert MP3 to AMR? MP3 is ono of the most common audio coding formats to store audio data. It’s widely used and natively supported by a lot of different mobile handsets like smartphones, tablets, MP3/MP4 players, etc. AMR files can usually be found on phones with voice recording features. It’s mostly used for voice recording. Due to this reason, AMR is also native supported by a variety of smartphones. But iOS stopped the support for it since iOS 4. If you want to convert MP3 to AMR, note that quality loss is inevitable. But a good audio converter could minimize the quality loss. In the following content, I’ll show you how to convert MP3 to AMR with two different kinds of audio converters. Leawo Video Converter is a top-of-the-class video converter program that is capable of converting 180+ different kinds of video and audio files between different formats. With it you can easily convert MP3 to AMR. 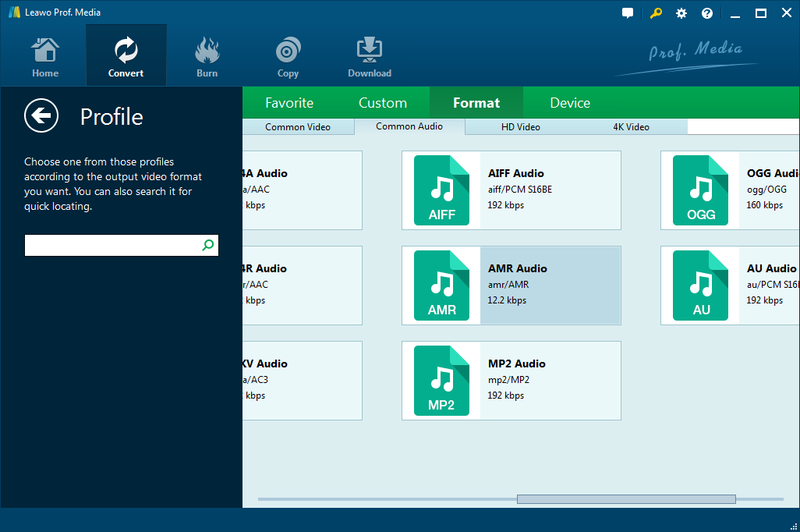 Here’s how to use Leawo Video Converter to convert MP3 to AMR. Step 1. Add MP3 to the converter. Leawo Video Converter is integrated into a software toolkit called Prof.Media. Just open it and then click the Video Converter tab on it to load video converter. And then click the Add Video button to import the MP3 files you want to convert to the program. You can also add MP3 to the conversion list by directly dragging the source MP3 files to the interface . Step 2. Choose AMR as the default output format. Click on the button to the left of the green Convert button and you will see a menu pop up with 3 buttons on it. Click on the Change button in the middle and you will open the Profile page where you can change the default output format. Find AMR under Common Audio tab and select it as the default output format. If you like, you can click the Edit button on the menu that mentioned before to edit the parameters of the output AMR file. Click that green Convert button and a sidebar would come out from the right side of the program. The option box under Save to tag is the default output path. If you want to change it, just click on the button next to the option box. Step 4. Start the MP3 to AMR conversion. To start converting MP3 to AMR, just click on the Convert button at the bottom of the sidebar. If you only have several MP3 audio files to convert to AMR, there’s another way to do it. You can go online and find an online video converter to convert MP3 to AMR online. It’s easy, convenient and requires no software installation on your computer. And the best part about using this kind of MP3 to AMR converter online is that they are free. But there are certain downsides about them. First, you will have to upload your MP3 files to the website first, and when the conversion process is finished, you will have to download them from the website again. It’s kind of troublesome especially when you have a lot of MP3 to convert. And that’s the reason why I wouldn’t recommend them to users who are converting a huge quantity of MP3 files. But if you can deal with them, then you can give these online MP3 to AMR converters a shot. The online video converter I’m using in the content below is convertio.co. It’s an online video/audio/image/document converter and it’s completely free. Also the conversion process is fairly simple and straightforward. Just follow the instructions below to convert MP3 to AMR with it. 1. Click on the link of convertio.co to open it with your browser. 2. To upload the source MP3 file to the website, you can either drag the files to the website or click the Computer icon and select the source MP3 files from your computer. 3. Click the option box to the right of the title of the MP3 file you’ve uploaded and select AMR as the default output format. 4. Click on the Convert button below and the the MP3 file will start to upload to the website and the MP3 to AMR conversion will start . 5. When the conversion is done, click on the Download button to download the converted file to your computer. This kind of MP3 to AMR converter online is convenient and specifically suitable for occasional need for conversions. But if you are looking for a serious MP3 to AMR converter download Leawo Video Converter and you won’t be disappointed. With it you can easily convert MP3 to OGG and any other kinds of audio files.